When served in optimum condition, draft beer can be utterly sublime. When draft is ripe with fresh flavors, sparkling condition and creamy foam, it’s no wonder people have sung its praises for millennia. It does, however, take some effort to get right and sometimes falls short of its promise. A great glass of draft beer depends on the brewer doing his or her job correctly, of course, but, unlike many other beverages, it is very much at the mercy of the people who pull those tap handles and maintain those draft lines. Beer’s great flavor and texture can be harmed by the way it is treated and served. 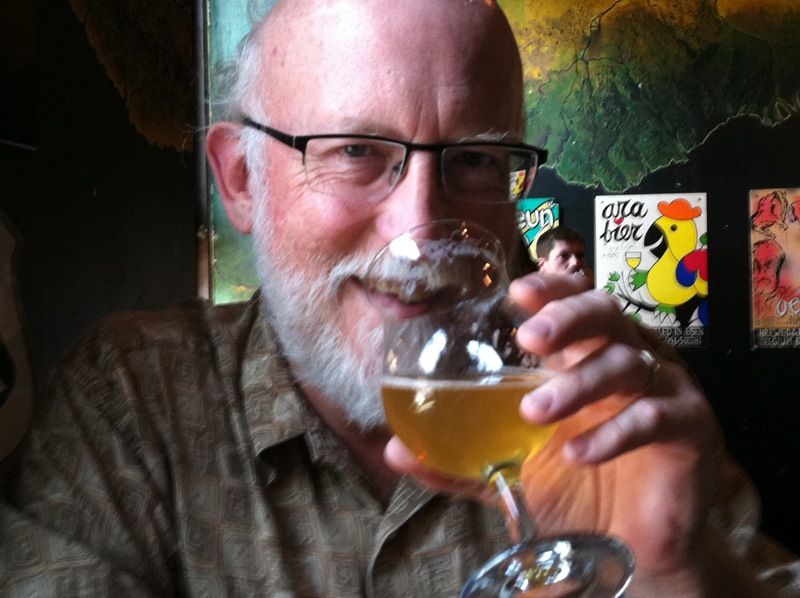 I’ll start with a rather extreme example: A few years ago at the end of a brutal day teaching homebrewing, a few of my fellow instructors and I sat down in a bar and ordered a round of beers from a reputable brewery whose products we knew well. The first glass on the table was inexplicably hazy and reeked of theater popcorn: the unmissable stench of a chemical called diacetyl, a common symptom of bacterial infection. The second beer was marginally better: crystal clear, but still plenty buttery. The third was almost right, with just a slight hint of butteriness, but definitely less than stellar. What happened? We had encountered the dreaded “first pour” syndrome. The beer had been sitting in the line since closing time last night. Normally this is no big deal, but when an establishment is less than scrupulous about cleaning its draft lines, the bacteria that are everywhere in the environment can snuggle in and take up residence, metabolizing residual carbohydrates in the beer and squirting out prodigious quantities of diacetyl as well as some other equally distracting chemicals. None of these off-flavors are harmful—they do occur in dairy products and other foods, for example—but they fairly well destroy the beer experience. My group quickly moved on to a more fastidious beer joint. This was an entirely preventable occurrence, caused by laziness or lack of attention to detail. Most experts recommend that lines be cleaned at least every two weeks; the best bars I know get to it weekly. The process normally involves detaching the lines from the kegs and circulating an alkaline cleaning solution through them and then, after a rinse, a sanitizer. One of the more extreme line-cleaning systems actually shoots little foam balls through the lines, helping scrub the tenacious protein and mineral film from the tubing. It’s not a glamorous part of the business, but a very necessary one. Fortunately, there are services that specialize in this so the staff doesn’t have to get down and dirty. That hapless bar lost us as customers forever that day. Even if most people can’t accurately diagnose a poorly served beer, they definitely know when something is wrong and will take their business elsewhere. There are other problems as well. Most health departments require that glassware be sanitized before being used to serve beer. This is great, but the sanitizers usually contain highly reactive chlorine or bromine. They are extremely effective, but it’s important to rinse the sanitized glasses thoroughly before filling them with beer. Any remaining sanitizer will react with tannins and other components in the beer to produce chlorophenols, potent aromatic chemicals that usually come across as “Band-Aid” in flavor. These can ruin a beer in a matter of seconds. They are not harmful in the low quantities present in a beer, but they have a nasty smell, and I sure don’t want to drink them. While not a taste problem, traces of detergent will cause another issue. The head of a beer is easily degraded by either fat or detergents (which are made from fats), so tainted glassware can sometimes cause the head of an otherwise fully carbonated beer to fall quickly. If you’re wearing lip balm or a juicy lip gloss, you may notice this same phenomenon—but of course in this case it’s on you, not the barkeep. Some bars don’t do all that great a job cleaning their glassware, but how can you tell when your glass arrives filled with beer? There are a couple of telltale signs. First are traces of lipstick or other oils around the rim. Generally the problem isn’t this extreme, but hidden dirt is made visible by patches of bubbles clinging to the side of the glass in the liquid. The reason a dirty glass will exhibit these (while a clean one will not) is that the dirt offers lots of nucleation sites: microscopically textured patches that allow bubbles to form. Check your glass when it arrives, as these will often disappear after a few minutes. There’s a neat trick that can be used to check glassware when there’s no beer in it. Take a purportedly clean glass, give it a quick rinse with water, then shake it out. Now, take a salt shaker and sprinkle the inside liberally. If the salt coating is splotchy or uneven, the glass needs a better cleaning. Water won’t stick to a clean glass, and without the water, neither will the salt. A well-worn glass can show similar nucleation evidence, usually near the bottom where the glass stacked on top of it during storage rubs and chafes. That one’s nothing to worry about, but of course seriously beat-up glassware shows a lack of concern for aesthetics at the least. Then there’s the issue of carbonation. The brewery sends its beer out at the desired carbonation level. It is the bar or restaurant’s duty to maintain it for best flavor and texture, but one often finds flat and lifeless beer pouring from the tap. Sometimes the culprit is carelessness, or perhaps a lack of pressure regulation for each individual keg. Other times it is caused by improper tap system design or installation that causes bartenders to turn the pressure down to keep foaming (and wasted beer) to a minimum. To be fair, some beer styles such as Belgian ales and weissbiers do require higher pressures and a little special treatment, but this is the price to be paid for selling specialty beer. The good places know how to deal with challenging beers. A more troubling and extreme problem comes from the use of mixed gas. Most “normal” beer is carbonated and dispensed with pure carbon dioxide gas. However, beers served “on nitro” are dispensed with a mix, typically of 25 percent CO2 and 75 percent nitrogen. This works great for the nitro beers and is responsible for their beautiful cascade of tiny bubbles and densely creamy head. When normal beer is hooked up to the mixed gas, however, the result is not a happy one. The CO2 pressure inside the keg eventually bleeds down to the low level of the mixed gas, and the beer loses much of its carbonation, turning flat and dull. So, now that you know what to look for, what’s to be done if there’s a problem? Your first defense is to send it back. It is standard practice in bars and restaurants to pour a new beer if a customer isn’t happy with a beer for any reason, so this is not a big ask. After one questionable beer, a taste of whatever you’re ordering next is not out of line. You’re not likely to get an argument, but do not accept the “It’s supposed to taste that way” comment—it is not supposed to taste that way. Try to be as specific about the problem as you can. If you need backup or the right language, you can tear this article out of the magazine and keep it in your wallet, or point the offending bar to the Cicerone syllabus online. Editor’s note: A previous version of this story stated that salt would adhere to dirty spots in a glass, when in actuality salt will stick to the clean spots. The salt test you mention is incorrect. Salt will adhere evenly to a clean glass. Anywhere salt is missing there is dirt. I do not agree with your description of what happens to regular beer on a 25/75 blend. Where did you get this from?Nitrogen is also blended with CO2 to propel traditional Lagers and Ales through a draft beer system. Lagers and Ales do not contain Nitrogen, so the Nitrogen is only used to compensate for the difference between the beer systems required applied pressure (propelling pressure) and the CO2 partial pressure needed to maintain the flavor and quality of the beer on tap. Typically beer systems greater than 15′ in length and or those with chronic temperature fluctuations will require the higher applied pressures. I can’t speak for Randy Mosher but I’ll go ahead explain how I interpreted it. When using a 25/75 gas blend in place of a 100% co2 or a 60/40 or 70/30 blend often times bars have done so mistakenly. In most systems if using a 25/75 blend you would need around 90 psig. I’d say if needing that much someone should be installing a pump instead. What I have seen occasionally is someone connected a non nitro keg and tap to a 25/75 gas line. When doing so at the normal gauge pressure the keg will continue to try and reach equilibrium and CO2 will leave the solution and enter the headspace. Great article and thank you for posting this. I wish all bars had someone who was responsible for ensuring standards are met. FYI, On the glassware salt test, where the salt sticks is when there is NO dirt or oils and that is good……. I second this… Where the salt sticks the glass is clean a daily will stick to the wet portion of glass where as it will not stick to the oils on the glass wall. Therefore where it is oily the salt will not stick. Overall great artical though! That is correct. Salt will cling to the clean areas in the glass,usually left over soap is the culprit. You can take the same glass,stick your fingers in it and rub the inside of the glass. Rinse it again and then take the salt shaker and salt away. Salt clings to the glass. You removed the left over soap. So, the glass that I poured a small amount of beer down the side of that foamed all the way to the top was most likely dirty, correct? I knew that I should have not used that glass. The beer in the glass smelled different from the beer in the bottle.